It’s the last day of the first week of school. The bloom of excitement is beginning to wilt with fatigue. Adrenaline no longer feeds the morning and the days are still hot, hot, hot. Walking into Trader Joe’s, I spied my favorite flower. summer’s end grace my desk. Thank you to Doraine Bennett at Dori Reads for hosting today’s roundup. Beautiful capture of the memories, especially returning to ‘field life’, Julieanne.. I know of that first week, the days filled with happy times, but routine tires at first. Enjoy the Friday & the weekend! A poem within the poem….these beauties can handle it….they are not shrinking violets, after all! Wishing you a breath of energy…..pace yourself is what I tell others and wish my own self could master. Thank you for your insight! Wishing you the same. I enjoyed your poem. I haven’t dabbled in poetry writing for awhile but you post has inspired me. And yes, your flowers are beautiful. Be sure to take a few moments to enjoy them. “a shock of sunlight within violet blue” — lovely description! Did you know cut flowers have been found to lower blood pressure? I think they work that way for me. I hope the weather cools off soon! I am blooming with excitement, too! “field life” love this! A glorious celebration of life in that poem. I love the same line as Tabatha. Lovely, Julieanne! Goddess of the rainbow is an apropos title for such a regal flower. It’s the last day of my kids’ first week back to school, too. Even without being a teacher, I feel exhausted. I’m impressed at your ability to manage such a stellar poem during the first week of school! Nicely done! So lovely, Julieanne – flowers in a classroom are as essential as books, I believe. Such beautiful bright flowers to brighten the end of the week. “Memories of field life” and walking with you gathering wild flowers. Makes me miss you more. “Goddess of the rainbow,” and such a beautiful pic. Thanks for sharing. Hope your heat calms down soon. What a great pick-me-up you found, and what a lovely tribute to the “sacrifice” of the irises. Your irises are beautiful, as are your words. Settle into the rhythm of the race now that the adrenaline is gone. There are flowers to admire all along the way. Love that, rhythm of the race! These irises are gorgeous, and so is your poem! Thank you. Beautiful imagery in the poem, to rival the flower itself. My kids were exhausted by Friday, too. Luckily the weekend came just in time. 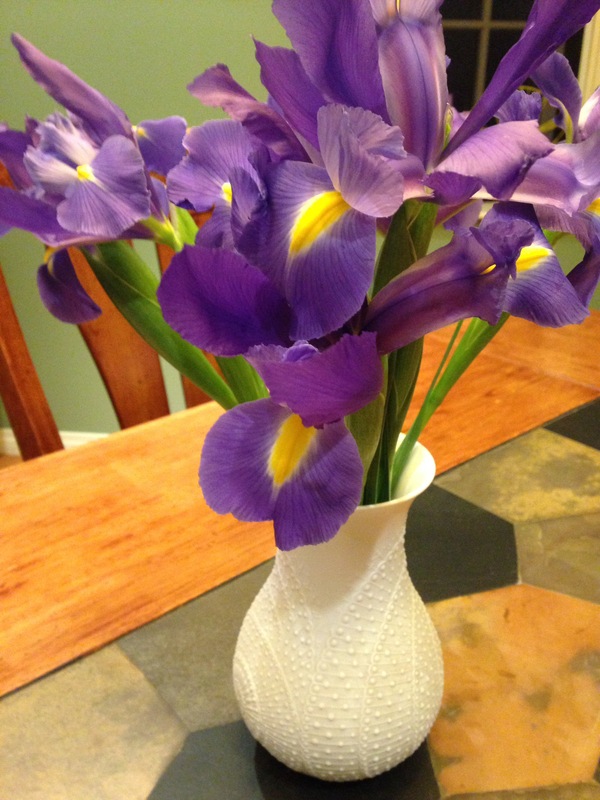 Beautiful irises, beautiful colors, beautiful poem. Thank you for your post. I enjoyed reading your creation.